American TV show Quantico took Priyanka Chopra's career on another level. With success of the thriller series the actress is now being considered as one of the top notch global celebrities. Also Bajirao Mastani actress is receiving good offers of films. The winner of the Miss World pageant of 2000 is now featured on the cover of one of the India's most prestigious magazines, 'India Today'. 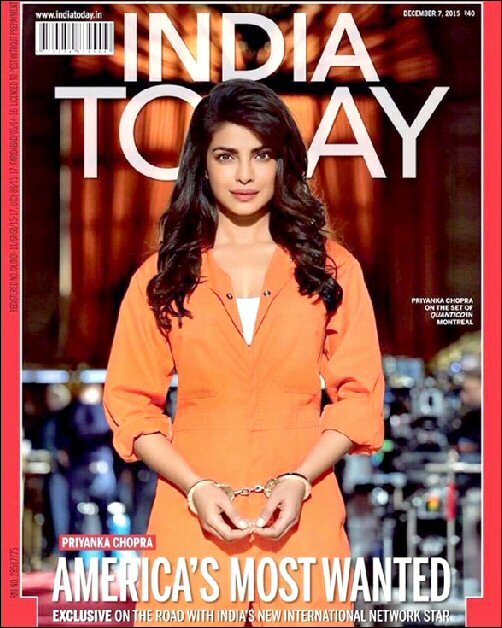 Unlike her other glamorous avtar's, Priyanka poses here Quantico's Alex Parrish, America's Most Wanted in the prisoner look after she gets arrested in the latest season of the series for allegedly masterminding a terrorist attack. Currently Priyanka is busy completing shoots of Quantico in Montreal. The actress is all set to arrive next month to join the cast of Bajirao Mastani, Deepika Padukone and Ranveer Singh to promote the film.